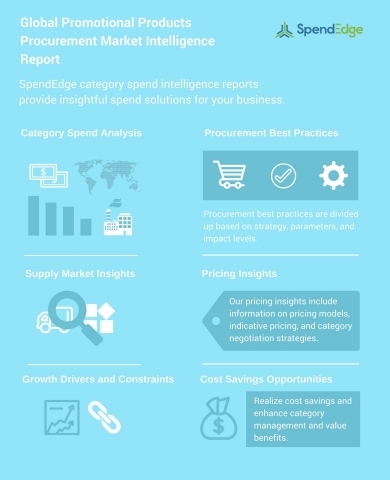 LONDON--(BUSINESS WIRE)-- Global procurement intelligence advisory firm, SpendEdge, has announced the release of their ‘Promotional Products Procurement Research Report.’ The insights and data in this report provide a strategic analysis of the supply markets, factors influencing purchasing decisions, procurement best practices, pricing models, supplier landscape, and an analysis of the supplier capability matrix for the marketing industry. This report breaks down the data and analysis behind the procurement of promotional products and acts as an all-inclusive guide for making smart purchasing decisions. “The global promotional product market is a fragmented market with the top ten suppliers accounting for less than half the size of the global market,” says SpendEdge procurement analyst Anil Seth. “This is due to increased number of web-based suppliers, low barriers to entry, and high demand for local suppliers because of decentralized procurement model,” added Anil. Increased number of small firms with limited budgets, the high cost of alternative media, demand for cost-effective marketing methods, technological innovations in promotional products, and availability of multiple products has been driving the expansion of the global promotional product market. Purchasing managers prefer suppliers that have a diverse portfolio, such as traditional goods that include bags and pens, as well as technologically advanced products such as wearables and activity tracking devices. Furthermore, they provide them with a wide variety of choice both in terms of the level of customer engagement as well as budgets. Cost reduction measures adopted by suppliers can lead to inadequate investment in supply chain systems, which can impact the sourcing and delivery services of suppliers. Purchasing managers are unable to collaborate with suppliers due to supply chain issues, such as greater lead time for procurement and delivery of products and high shipping costs. The cost plus markup pricing and indexed pricing methods are the two widely adopted pricing models in the promotional products market. However, procurement analysts at SpendEdge observed that cost-plus markup pricing model has high potential and will gain higher adoption level in the forecast period. It offers clarity on supplier markups and high transparency in pricing method. Get unlimited access to all our reports. Our Insights platform provides ready-to-use procurement research reports, latest supplier news, innovation landscape, markets insights, supplier tracking, and much more at the click of a button. Start your 14-day trial now.